Our calendar had to endure a whole series of reforms and modifications before it reached the so acquainted and perfectly natural regarded structure it has today. Its tracks can be traced back almost completely. The roots of our calendar therefore embedded in the Egyptian solar calendar. They directed themselves not according to the moon but according to the sun. 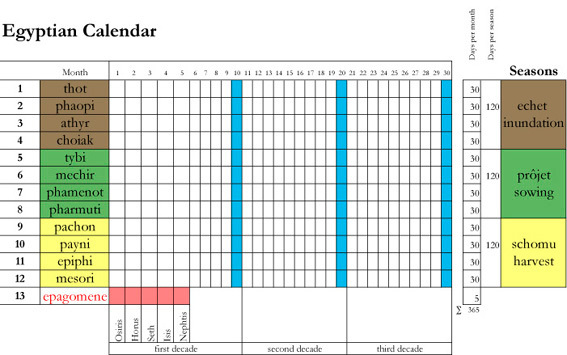 This calendar was discovered by Caesar whilst visiting Cleopatra. The Egyptians took a generous 360 days which were divided into 3 seasons, each of 120 days, or 12 months each with 30 days. To compensate for the missing days  there were only 360 instead of 365 -, 5 days were attached to each year, the so-called Epagomens.